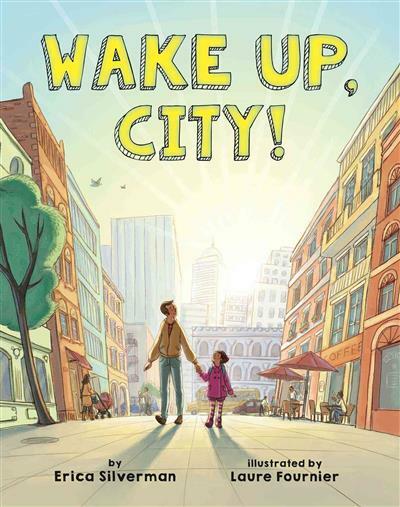 In this beautifully illustrated picture book, one littlegirl and her father are on their way to school as the whole city wakes up around them! The gumdrop sun rises high in the cotton candy sky. A woman stretches. She starts to run. The city morning has begun! The city is still fast asleep when a young girl and her father leave the house. But slowly, little by little, light starts to creep up over the buildings, and the city starts to wake up. As they walk through the drowsy streets, a woman begins her morning jog, street sweepers clean up the roads, stores begin to open, and food deliveries are made to stores and restaurants. 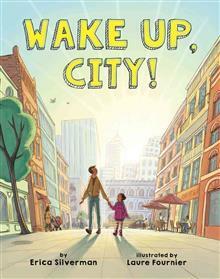 Join these two on their morning walk to school through the city in this beautifully illustrated picture book. Erica Silverman is a librarian and the author of several books including Big Pumpkin, When the Chickens Went on Strike, which was a Sydney Taylor Honor book, and Sholom's Treasure, which won the Sydney Taylor Award and was a runner-up for the National Jewish Book Award. Her books have received the Oppenheim Toy Portfolio Gold Award, the California Young Reader Medal, ABA Pick of the List, and the first book in her early-reader series Cowgirl Kate and Cocoa won the Theodor Seuss Geisel Honor. She lives in Los Angeles, California. You can find out more about Erica at ericasilverman.com. Laure Fournier was born in Antibes, France. She studied in the Emile Cohl School of Art in Lyon (France) before continuing her studies at Swindon College in England. Since graduating, she has worked as a children's book illustrator. She regularly goes to Burkina Faso in Africa, making bronze sculptures that also serve as inspiration for her illustrations.